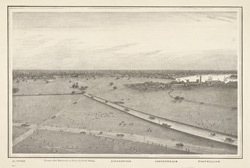 Uncoloured lithograph of a panorama of Calcutta drawn after nature by Frederick Fiebig and prepared, printed and published by T. Black of the Asiatic Lithographic Press in Calcutta in 1847. The first section shows Alipore, Kidderpore and Garden Reach and Fort William seen on the right. The Fort was rebuilt to the south of Calcutta in 1757. Designed by John Brohier, the structure is polygonal in form and has extensive defences including bastions, earthworks and a moat. Inside the fort, we can see the garrison church of St Peter that dates from 1826. The area surrounding the fort, known as the Maidan, was cleared to provide an unrestricted line of fire.